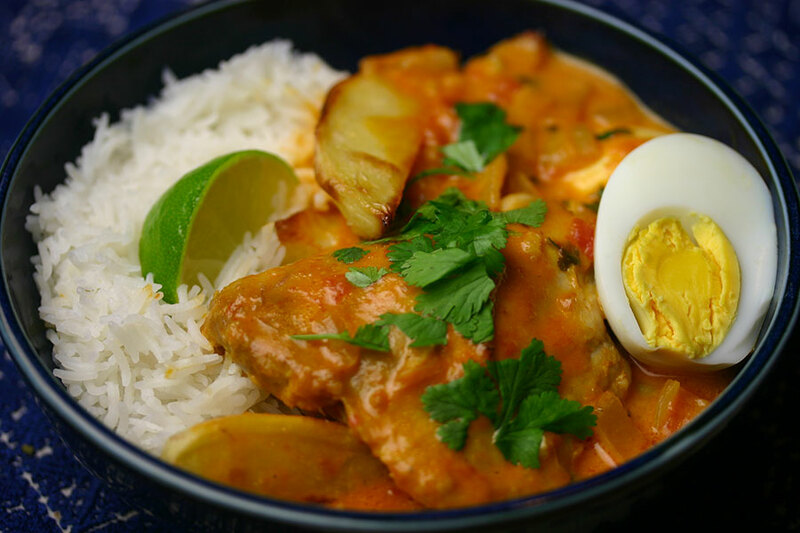 Kuku paka – Kenyan chicken and potato curry – is both simple and delicious. Unlike many curries, the chicken are cooked separately – which keeps the flavours and textures distinct– and folded into the coconut curry sauce just before serving. In a small bowl, whisk together ginger, garlic, salt, and sunflower oil to make a marinade. Place the chicken pieces in a large, ziplock bag. Pour the marinade over the chicken, seal and leave in the fridge for at least two hours (or overnight). Preheat the oven to 375°F (185°C). Oil two baking sheets – arrange the chicken pieces on one, and the potato slices on the other. Drizzle the potatoes with oil, and season with salt and pepper. Bake the chicken and potatoes for about 45 minutes, or until cooked through. While the chicken and potatoes are cooking, make the sauce. Heat the oil in a wide saucepan over a medium flame. Add the onion and sauté until softened. Add the garlic, ginger and chilli and cook a few minutes more. Stir in the turmeric, cumin, sugar and salt, then add the tomatoes, breaking them up (if whole) with a wooden spoon. Cook for about five minutes, or until the tomatoes start to form a sauce. Add the coconut milk and heat through without boiling then remove from the heat. Stir in the lime juice and adjust the seasoning. Add the cooked chicken, potatoes and eggs to the saucepan, carefully spooning the sauce to cover them. Serve garnished with the chopped coriander. Recipe found on Ten More Bites.